Dressed in their finest pirate costumes, Penguin Blue and his friends set out across the seven seas in search of treasure. Things take a turn for the worst when their rubber dingy unexpectedly gets sunk! But, this leads them on an adventure that will ultimately be worth much more than gold. Sunk! 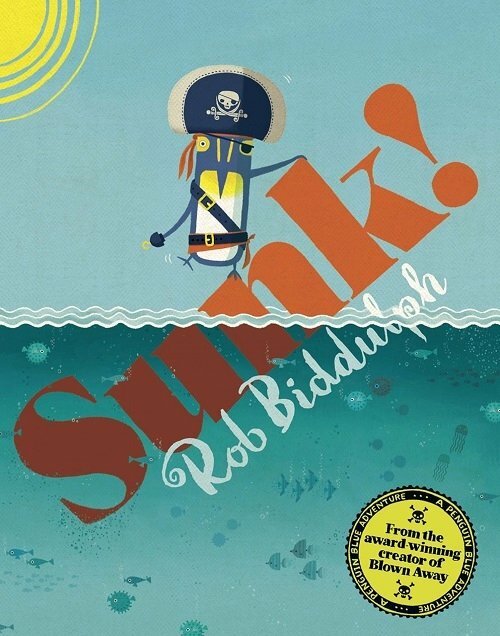 is the sequel to Rob Biddulph’s award-winning Blown Away and is equally as engaging and fun to read. The illustrations are cute, colourful and incredibly detailed - children will have plenty of fun labelling the ocean animal characters and describing what they can see on the pages. There are opportunities for drawing inferences from the illustrations (e.g. “Why did the ship sink?” I can see a big hole in it! “Where was the treasure?” Look, there's a big 'X' on the island!). The bouncy rhyming text makes it fun to read aloud, and there are plenty of words containing /s/ for children to listen to and practise saying if they’re working on this sound.